NAISDA was thrilled to welcome the multi-talented Matthew Doyle to campus recently to complete an on-site Cultural Residency, teaching our Developing Artists the language, stories and dances of the Dharawal people. 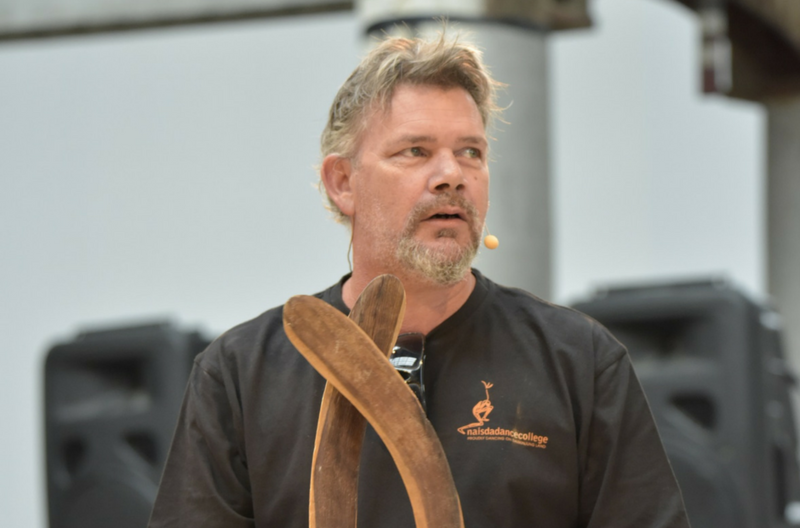 A 1988 NAISDA graduate, Matthew is a celebrated performer, musician, composer and teacher. 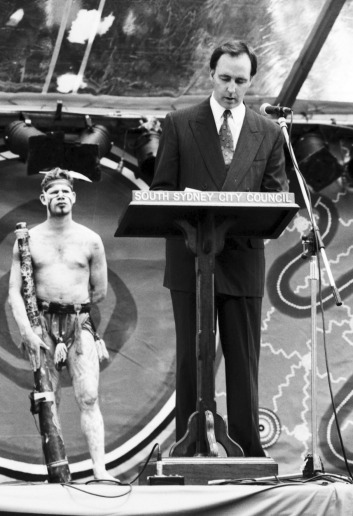 Matthew has experienced many highlights throughout his distinguished career, from touring with world-renowned dance companies Bangarra and AIDT and his iconic didgeridoo performance on top of the Sydney Harbour Bridge for its 75th anniversary to performing at the Opening Ceremony of the 2000 Sydney Olympics and working with some of the world’s most admired artists. Matthew has represented Indigenous Australia all over the world, from Belgium to Brunei, and has performed for dignitaries including Pope Benedict XVI and Charles, Prince of Wales. Here’s what Matthew had to say about his experiences teaching at NAISDA and what NAISDA means to him. I was born and raised in Sydney with Aboriginal and Irish heritage on both sides of my family. I went to school in Sydney and was lucky enough to be accepted into NAISDA when I was only 15 years old. I studied full-time for three years at NAISDA and graduated in 1988. After that, I freelanced and returned to NAISDA to assist Cultural Tutors in the teaching of their songs, dances and language to students. I spent six months at Bangarra and then joined the AIDT company where I travelled and toured. Since then I’ve been working for myself. In an educational capacity, I visit schools around NSW and interstate and do cultural educational tours, teaching and sharing culture. I also work professionally as a musician, performer and composer. You’ve been a guest Cultural Trainer at NAISDA over the last few weeks, what have you been teaching the Developing Artists? As part of my Cultural Residency at NAISDA I introduced the Developing Artists to language, teaching them three songs in Dharawal language. I also taught them the stories and dances that go with these songs. They learnt six dances all up over three weeks, which was intensive but a great experience. I’ve also been able to share a lot of my experiences with them. I look back and see myself in a lot of them – ready to learn and absorb information like a big sponge. What do you think is the most rewarding part of sharing cultural knowledge with NAISDA’s Developing Artists and other young people? I get personal satisfaction knowing that I’m fulfilling my role as a person of cultural knowledge by sharing my learnings with our young people. I’m grateful that I get to do my part in sharing culture and breaking down barriers. Hopefully, I’m also inspiring people to follow their dreams, whatever they may be. You attended NAISDA in the ‘80s, how has it changed since then? When I was at NAISDA it was in located in Glebe. It then relocated to Sydney and eventually to its current location on the Central Coast. In addition to the venue, the staff has also changed, and so have the course offerings. It’s a lot more structured now, more focussed and run like a College. What hasn’t changed though is that when I was there, NAISDA was like one big family. I definitely still sense that. I want to thank NAISDA for being there for the community. For being the place that it is and what it offers to our young people. Without it, I think a lot of our young people wouldn’t know what pathways to take if it weren’t for NAISDA. I hold it in high regard.